The odd thing about iPods is that they were created so that you could walk down the street, drowning out the outside world, oblivious to all human contact. Yet for some reason, folks immediately realized that these devices could also become the center of their home entertainment systems where they could impose their musical tastes on others. What followed were a variety of docks, some simple - just a set of audio out jacks - to complicated systems that could spread the joy throughout your home. The best of the docks, such as DLO’s HomeDock Deluxe, which we reviewed in the past, worked great, especially if connected to your television. Anyone who has used a remote control with their iPod, know that they all have one thing in common: you can’t actually see what you are controlling. Not so with the new Keyspan TuneView for iPod remote control and docking station. Attach the dock to your stereo and the video out to your TV, and insert your iPod, and turn on the TuneView, and you have the screen from your iPod on the TuneView’s remote which has it’s own color LCD screen. Once you have used the TuneView, it makes total sense and you wonder why others didn’t do this from the start! It has a range of 1500 feet, so you can essentially plug in the iPod and forget about it. Because the TuneView has a USB connection, it can be synced to your PC or Mac, and is firmware upgradable. 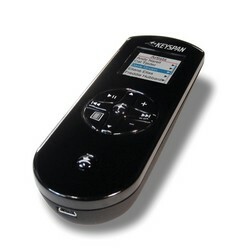 We think that Keyspan’s TuneView will let you view and control your iPod in an entirely new light! Highly recommended.